A personalized cut-out initial oval signet ring with our unique signature font crafted in your choice of 10k or 14k white gold (also available in yellow gold by request or sterling silver shown below). Shown in the initial, "B" - if you would like to see your letter prior to order, please email us and we will respond with a rendering of your initial. Made to order in the U.S.A. Please allow approx 7-10 business days prior to shipping. 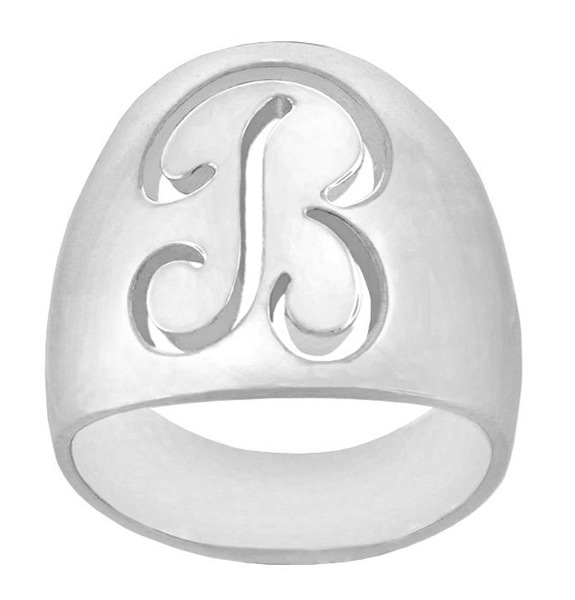 We guarantee our Cut-Out Initial Oval Signet Ring in White Gold to be high quality, authentic jewelry, as described above.